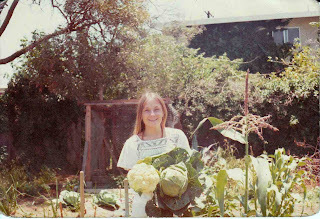 That's me, Jo Anne, in my first organic garden in 1975. I was a student at UCSD living in a rented duplex. In the back there was a yard with strawberry plants and a peach tree. Behind that was a large lot full of waist-high weeds. I'm not sure how I figured it all out, but I chopped down the weeds with a scicle, then rented a roto-tiller and tilled up the whole 40' x 40' space by myself. Perhaps I got suggestions from the Farm Advisors, I don't remember, but after having the soil tested, the next thing I did was bring in a truck load of chicken manure and bags of redwood compost. The bus driver whose bus I took to the University was a worm rancher, and I bought a pound of red worms from him. I carried them around the campus all that day in a Chinese take-out container; no one was the wiser. Then I decided I must have hens, so I purchased 3 Rhode Island Reds. I loved those girls! Every morning before school, I'd go out and say, "Good morning, Girls", and they always had warm eggs waiting for me. It was wonderful. Wonderful, but alas, short lived - my neighbor had a German Shepherd which he was feeding a vegetarian diet. The dog was not at all happy with the arrangement, and one horrible morning, I found that he had jumped the fence into my yard, chased off my girls, and trampled up the garden. I never saw my hens again...just feathers and damaged vegetables. Poor girls. Everything in the garden grew bountifully, except my corn - it was stunted and scrawny. My Grandmother (a corn farmer in Indiana) came for a visit with my Mom one day. I was so proud to show her my garden. She was impressed with everything except, of course, my corn. She laughed as she told me I had to grow it in blocks of at least "10 x 10"... I only had to make that mistake once! For whatever reason, I had to move from that duplex just as the garden was beginning to peak, and I regrettably had to leave the best harvests to the new tenant. The experience stayed with me, though. Through the years, I've grown tomatoes, squash and green beans, and my beloved roses, but I never again had a large in-ground garden. Life is just too busy for that now, and with our "Two Dogs" (the ones who promptly destroyed the back yard when we brought them home from the Shelter), it's just not practical. So we garden in EarthBoxes, which are easy and so productive. But my thoughts here are not on the EarthBoxes...I'm thinking about what I had embroidered on my home-made book bag in 1975: there were embroidered flowers surrounded with the lyric, "We've got to get ourselves back to the Garden"... who sang that first? Joni Mitchell or Crosby, Stills and Nash??? Just last week, some neighbors whose ages are roughly in the vicinity of mine, came over to the Home Nursery to purchase lots of veggie babies for their garden (which is boldly situated in their front yard!). We got to talking about how we were "back then", and how happy we are to have come back to the "Garden"...and wished we'd never gotten away from it. We all laughed when I joked, Sheesh, if I'd just stayed with it, I'd be Alice Waters!! But as the saying goes, better late than never... And as we head toward the New Year, especially in these unsettled times, Alex and I renew the Two Dog pledge to "Support Urban Gardening one organic seed at a time". If you've been thinking about it, get started! If you usually only plant in Summer, start a Winter garden now! Big plots, small pots...it doesn't matter, just grow something. It'll change your life, your mind, your mood. It's true, now more than ever, we've got to get ourselves back to the Garden. It was fun to read a little about your background and gardening passion! You certainly have helped many people dive in and grow something! I am so grateful to have Two Dog and YOU! I think of you every morning when I go out and harvest, prune, fertilize, water, stake, spray and enjoy!!!! Thank you for making this possible for us!